Peel the celeriac, using a sharp knife to remove all the knobbly bits and nick out the eyes. Grate the celeriac into long fine strips. Drop into a colander, sprinkle lightly with salt and leave for an hour to wilt and drain. Make the mayonnaise. Before you begin, make sure the ingredients are all at room temperature. Put the egg yolk in a bowl with the mustard and whisk together. Then, very slowly at first, whisk in the oil in a thin stream, forming an emulsion. As soon as the mix starts to thicken, switch to beating with a wooden spoon. Steadily increase the stream of oil as the mayonnaise acquires a wobbly texture. You may need a little more or less oil, but stop when the mayonnaise is thick and glossy with the consistency of soft butter. As you go, add the vinegar, a teaspoon at a time (you may not need it all; you want to just sharpen the flavour). Alternatively, you can make the mayonnaise in a blender, drizzling in the oil in a thin stream. To make the remoulade, whisk the vinegar with the mustard and honey then beat in the oil slowly until you have an emulsified sauce. 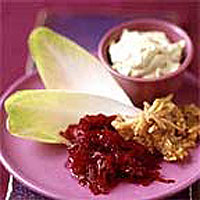 Toss the remoulade with the grated celeriac, which will soak up the dressing. Pat the beetroot dry on some sheets of kitchen paper then grate it finely and toss with the lemon juice and enough oil to give a shine. Pile the beetroot and celeriac in separate heaps with the mayonnaise in a bowl on the side. Serve with a few leaves of chicory to cut the richness.